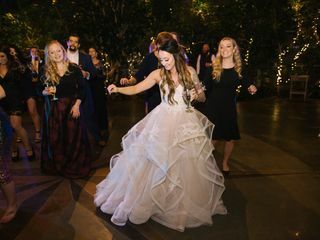 Eli was accommodating and guided me through the entire process from set up to tear down of not only the music for the wedding but also in collaboration with the event planner at La Caille. Eli came highly recommended and he was absolutely worth it! I have never heard of the DJ who also checked with the wait staff to make sure timing for food was going well, brought us hot towels for our hands before our big dinner, and also was able to make changes on the fly for us as far as announcing songs, requests, etc. It was a honor to have him be a part of our special day and I would 100% recommend him to anyone! Eli was great! He was very accommodating to my very specific instructions regarding the music and did a great job! He was also a fantastic MC. He even showed up early to help with a technical difficulty. You're in good hands with Eli. Eli was great to do business with, he was very organized, calm, collected, and professional. The first time we met him he had great ideas that we incorporated into our day, and by the end of the final meeting before the wedding we both felt very confident and comfortable. And he delivered! He was also an incredible master of ceremonies, keeping us on schedule and expertly handling impromptu speakers. I cannot say enough about how professional and fun he was. I would recommend him to anyone.